The Grove, a destination location for dining, entertainment, hospitality and retail fronting the fully improved Randall Road and the Interstate 90 interchange. Identified as one of the main "hubs" for corporate growth and residential traffic in all of Northeastern Illinois. 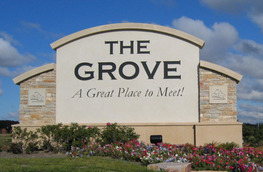 The Grove incorporates the finest in land planning design, architecture and landscaping into a themed, pedestrian friendly restaurant and specialty retail development. Master planned landscaping and signage, pond views with fountain, perfect for outdoor seating, period lighting, pedestrian plazas, distinctive fountains, interconnecting sidewalks, and low taxes.